I was sorting through some old snapshots last week, looking for photos to copy for my sister. Among the "must scrap" images that I found was this one of my sister and me, along with two of our cousins taken in 1950, that I thought would be perfect for this month's All That Flutters Challenge. I used pretty much the last of my July Moments Captured kit from Swirlydoos to create this page invoking a long-ago summer day. The Kaisercraft doily was colored with Ranger Distress Ink in Faded Jeans and put aside to dry. Meanwhile, I cut a large circle from the center of the Hampton sheet from the Kaisercraft Provincial collection before adhering it to the back of Morning Glory from Pion Design's Mister Tom's Treasures that I had run through my Distrezz machine. Next, using a few scraps from previous projects, I cut out a smaller circle and a bit of matting for my photo, lightly distressed and inked them and glued them down. I created a few lace-like strips using a double-edge punch from Martha Stewart and placed them on the side and here and there under the edges around the border of the page. 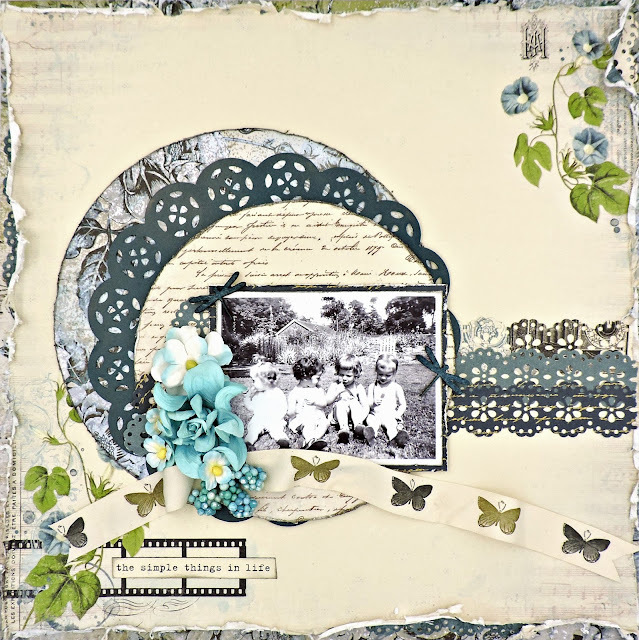 To embellish my photo, I glued down a bit of the pretty May Arts trim, a few of the Prima Vieille Vine blooms and berries and the last of my Kaisercraft dragonflies. I finished the page by adhering a strip from the Mister Tom's Treasures Borders page on the bottom over the filmstrip image. From left to right - my sister Jean, my cousins Jane and Mary and me on the end enjoying our lollypops. Behind us is the reason that I wish that this had been taken in color - my Grandmother's gorgeous rock garden.